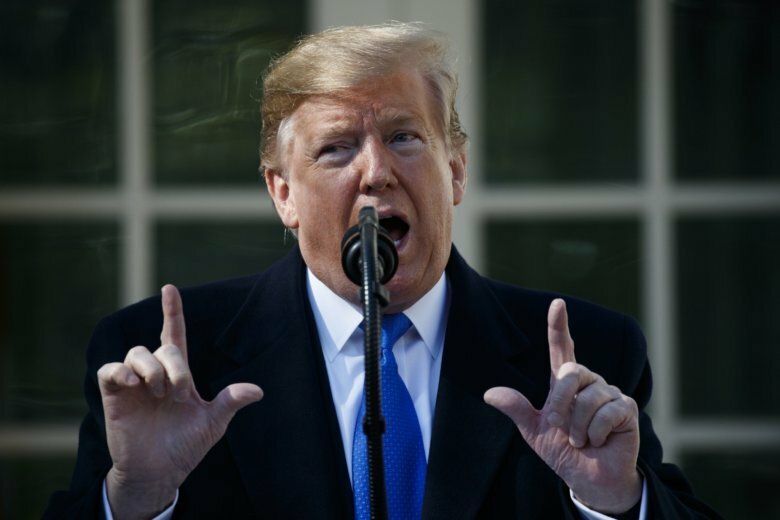 WASHINGTON (AP) — President Donald Trump describes drugs flowing across the hinterlands from Mexico, a federal prison population laden with criminals who are in the U.S. illegally and a Texas city transformed by a border barrier into a safe place to live. It’s a misleading and in some ways false picture, and one that underpins his extraordinary declaration of a national emergency at the southern border. TRUMP: “I’ve built a lot of wall. I have a lot of money, and I’ve built a lot of wall.” — Rose Garden remarks Friday. THE FACTS: He’s built no new miles of wall, lacking the money. His new construction to date has replaced existing barriers. This month marks the start of construction of 14 miles (22 kilometers) of fencing in the Rio Grande Valley in Texas, the first lengthening of barrier in his presidency. That’s from money approved by Congress a year ago, most of which was for renovating existing barrier. Trump often has often portrayed his wall, falsely, as largely complete, to a point where “Finish the wall” has become his rallying cry, replacing “Build the wall.” That masks a distinct lack of progress in physically sealing the border — a frustration that is now prompting him to find money outside the normal channels of congressional appropriation. Trump inherited about 650 miles (1,050 km) of physical border barrier from previous administrations. TRUMP, on past presidents declaring national emergencies: “There’s rarely been a problem. They sign it; nobody cares. I guess they weren’t very exciting. But nobody cares. … And the people that say we create precedent — well, what do you have? Fifty-six? There are a lot of times — well, that’s creating precedent. And many of those are far less important than having a border.” — Rose Garden remarks. THE FACTS: Those declarations were rarely as consequential, and that’s precisely why they were mostly uncontroversial. He’s roughly correct about the numbers. But past declarations did not involve the unilateral spending of substantial sums of money that Congress — which holds the power of the purse — did not approve. Trump’s number resembles findings from the Brennan Center for Justice , which has tracked 58 emergency declarations back to 1978. TRUMP: “And a big majority of the big drugs — the big drug loads — don’t go through ports of entry. They can’t go through ports of entry. You can’t take big loads because you have people — we have some very capable people; the Border Patrol, law enforcement — looking.” — Rose Garden remarks. TRUMP: “We have tremendous amounts of drugs flowing into our country, much of it coming from the southern border. When you look and when you listen to politicians — in particular, certain Democrats — they say it all comes through the port of entry. It’s wrong. It’s wrong. It’s just a lie. It’s all a lie.” — Rose Garden remarks. “Only a small percentage” of heroin seized by U.S. authorities comes across on territory between ports of entry, the agency says, and the same is true of drugs generally. The great majority of heroin, methamphetamines, cocaine and fentanyl is seized at ports of entry. Marijuana is one exception; significant quantities are seized between entry ports. Even if a wall could stop all drugs from Mexico, America’s drug problem would be far from over. The U.S. Centers for Disease Control and Prevention says about 40 percent of opioid deaths in 2016 involved prescription painkillers. Those drugs are made by pharmaceutical companies. Some feed the addiction of people who have prescriptions; others are stolen and sold on the black market. Moreover, illicit versions of powerful synthetic opioids such as fentanyl have come to the U.S. from China, not Mexico. TRUMP: “Take a look at our federal prison population. See how many of them, percentage-wise, are illegal aliens. Just see. Go ahead and see.” — Rose Garden remarks. THE FACTS: About 40 percent of the people who entered federal prison in 2014 were foreigners, according to the most recent Bureau of Justice Statistics report. The vast majority of the foreigners (20,842 of 28,821) were being held for immigration violations, not violent or property crimes. It’s not clear how many were in the country illegally. The federal prison population is not a solid yardstick of immigrant crime because it represents only 10 percent of the overall prison population of the U.S. Most people convicted of crimes are in state prison. SEN. DIANNE FEINSTEIN, Democrat of California: “Unauthorized border crossings are at their lowest levels in decades, about one-third of their peak levels two decades ago. If there were an emergency, the president wouldn’t have waited two years to make this political decision.” — tweet Thursday. CALIFORNIA GOV. GAVIN NEWSOM: “We are currently experiencing the lowest number of (illegal) border crossings since 1971.” — State of the State speech Tuesday. THE FACTS: They’re wrong in saying illegal crossings are the lowest in recent decades, based on Border Patrol arrests, the most widely used gauge. That was true in the 2017 budget year, when Border Patrol arrests along the Mexican border fell to 303,916, the smallest number since 1971. But arrests jumped 31 percent last year, to 396,579. And in the 2019 budget year, which started in October, southern border arrests nearly doubled through January, to 201,497 from 109,543 the same period a year earlier. DEMOCRATIC SEN. AMY KLOBUCHAR, a 2020 presidential candidate, responding to reports she can be a tough boss: “I was teasing President Obama the other day. They have hired, the White House hired, over 20 of my staff members. You only have about 25 in a Senate office. And a number of them have come back to me when they were over there. So that’s my story. I know I can be too tough sometimes. And I can push too hard, that’s obvious. But a lot of it is because I have high expectations for myself, I have high expectations for the people that work with me.” — interview Monday with MSNBC. KLOBUCHAR CAMPAIGN: “She has many staff … who have gone on to do amazing things, from working in the Obama Administration (over 20 of them) to running for office to even serving as the Agriculture Commissioner for Minnesota.” — statement to news media this month. Among them are Jake Sullivan, a former chief counsel to Klobuchar who served in Obama’s State Department and was Vice President Joe Biden’s national security adviser; Rob Friedlander, a former Klobuchar press secretary who became a spokesman in the Obama Treasury Department; and Joe Paulsen, who worked on Klobuchar’s advance team and moved on to become an Obama aide and the president’s golfing buddy. As for “a number of them” coming back to work for her again, three were identified by her campaign team. They are Brigit Helgen, a former Klobuchar press secretary who served in the U.S. Trade Representative’s office in the Obama administration and returned as Klobuchar’s chief of staff; Hannah Hankins, a former special assistant who served as communications director and senior adviser for Obama’s Domestic Policy Council and returned as Klobuchar’s deputy chief of staff; and Andrea Mokros, a former Klobuchar deputy chief of staff who later managed scheduling and advance operations for first lady Michelle Obama. Mokros was an outside political consultant for Klobuchar for her 2018 Senate re-election campaign. TRUMP: “A lot of car companies are coming back to the United States.” — Cabinet meeting Tuesday. TRUMP: “We’re most proud of the fact — you look at the car companies, they’re moving back, they’re going into Michigan, they’re going into Pennsylvania, they’re going back to Ohio, so many companies are coming back.” — El Paso, Texas, rally Monday. TRUMP: “We have massive numbers of companies coming back into our country — car companies. We have seven car companies coming back in right now and there’s going to be a lot more.” — remarks to reporters Feb. 6. THE FACTS: There’s no such discernible influx. And at the end of this past week, industrial production numbers for January showed an 8.8 percent plunge in the making of motor vehicles and auto parts from the previous month. Since Trump took office in 2017, auto manufacturing employment has risen by about 51,000 jobs to just over 1 million, according to the Labor Department. That’s a 5 percent increase over two years. There have been new factory announcements, but excluding those that were planned before Trump took office, they don’t add up to seven. Fiat Chrysler also has nebulous plans to return some pickup truck production from Mexico to suburban Detroit next year, and it may reopen a small Detroit factory to build an SUV. At least one Chinese automaker wants to build in the U.S. starting next year but hasn’t announced a site. TRUMP: “China’s paying us billions of dollars a year in tariffs.” — Rose Garden remarks. TRUMP: “Another one they said could never get passed, they have been trying to do it for 40 years, we passed VA Choice. Veterans Choice. … VA Choice, they would wait on line for days and weeks, they couldn’t see a doctor. Now, they go out, they have a choice. They get a private doctor, they have things taken care of, and we pay their bills.” — El Paso rally. That’s because veterans often must wait even longer for an appointment in the private sector. Last year, then-Secretary David Shulkin said VA care is “often 40 percent better in terms of wait times” compared with the private sector. In 2018, 34 percent of all VA appointments were with outside physicians, down from 36 percent in 2017. TRUMP, on the effects of the Green New Deal floated by some Democrats: “You’re not allowed to own cows anymore.” He added that the plan would “shut down American energy” and “a little thing called air travel.” — El Paso rally Monday. TRUMP, on the effect of a border wall on crime in El Paso: “When that wall went up, it’s a whole different ball game. … I don’t care whether a mayor is a Republican or a Democrat. They’re full of crap when they say it hasn’t made a big difference. I heard the same thing from the fake news. They said, ‘Oh crime, it actually stayed the same.’ It didn’t stay the same. It went way down. … Thanks to a powerful border wall in El Paso, Texas, it’s one of America’s safest cities now.” — El Paso rally. TRUMP, describing the crowd for a competing rally in El Paso, Texas, led by Beto O’Rourke, a potential 2020 Democratic presidential candidate: “He has 200 people, 300 people, not too good. … That may be the end of his presidential bid.” — El Paso rally. THE FACTS: That’s far from true. O’Rourke’s march and rally drew thousands. Police did not give an estimate, but his crowd filled up nearly all of a baseball field from the stage at the infield to the edge of outfield and was tightly packed. TRUMP: “Illegal immigration hurts all Americans, including millions of legal immigrants, by driving down wages, draining public resources and claiming countless innocent lives.” — El Paso rally. TRUMP: “We’re going to El Paso. … We’re going there to keep our country safe, and we don’t want murderers and drug dealers and gang members, MS-13, and some of the worst people in the world coming into our country. … We need a wall.” — White House remarks Monday.